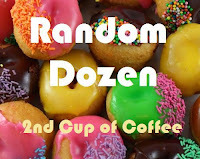 Go see Linda over at 2nd cup of coffee and join in on the fun! 1. How good are you at delaying gratification? 2. Maybe a marshmallow wouldn't be too difficult a temptation for you. What food would be most tempting? French fries. I simply cannot resist a fresh, hot french fry. 3. On a scale of 1-10 (10 being saintly) how patient are you? Can we talk negative numbers? And I am a lot more patient than I was earlier in my life. I try to be patient with non-relatives but with relatives (like people who live with me), not so much. 4. Have you ever waited for something in life only to be disappointed upon realization of the goal/object/etc.? Um. I am sure there is something but I simply cannot find it right now. 5. Are you a person who takes shortcuts? I like things to be done 'right'. Not perfect but right. Say I was going to paint my house. I would want to scrap it, repair it, prime it and paint it. I do have a tendency to take shortcuts when I am sewing or altering twirling costumes. 6. Which line is hardest to wait in? I don't mind waiting in line. I like to watch people and visit with the others who are waiting. I have also come to the conclusion that I cannot control the line, so I might as well enjoy the time. 7. Did you wait to discover the gender of your unborn child until its birth? Nope. We didn't have a sonogram with my oldest child so she was just what we wanted--a baby. The twins had several sonograms that should have tipped me to their personalities--stubborn. They wouldn't ever let us see--we also told the techs each time that we weren't really interested in knowing the gender. And they were just what we wanted--babies. I think that not knowing is a wonderful part of being pregnant. 8. Are you more patient with children or the elderly? Both. In my mind, I remind myself that that could be my grandma or my child, and how would I like them to be treated? 9. Did you ever sneak a peek at a present? Have you met my mother? Um. NO. 10. What is the longest you've ever waited for anything? We waited a reeeaaaaalllllyyyyyyy long time to buy a house. We searched for years. I have looked at a LOT of houses in our community. My realtor found a 'real' job while we were searching. Bless her heart, she tried and tried. 11. Who has more patience, you or your significant other? The man is an absolute saint. He is off the scale with patience. See question 10. It is completely amazing to be in his presence. I will tell you that if he becomes impatient, it isn't pretty. 12. Which of the following songs about waiting is your pick for the best? You make me laugh! We are so similar! I am much more patient than I used to be--though still bad. I talk to people in lines. If I'm going to be stuck in a line, I might as well figure out some way to enjoy it. (Kids are my favorite!) Happy Wednesday! The picture of your mom cracked me up...that is a perfect face for the question. I agree with #7...I loved the anticipation of waiting for the birthday to find out what I was having. Not for everyone I know but I loved that part. You ARE too funny. I think I would have been in big trouble with your mom the year I peeked. LOL. I like also when you said, "We got what we wanted--babies." LOL. #2 I can't resist hot fresh french fries either. That was my answer too. I like your answer to #7!! And number 9 cracked me up!! Love the pic of your mom. Love fresh french fries. Yummy! Love that pic of your mom! So funny with your answer! Can I change my answer? Richard Marx is lucky I didn't know about him in the 80's (stalker?!) Just kidding, a little. He's got a little bit of Constantine Maroulis from American Idol going on. Thanks, youtube. Your mom's pic even scares my Mr. T pic! :) Too funny! Love the pic of your mom... I wouldn't peak either! lolol. I talk to people in line also or on elevators. I remember one time my kid said mom who was that and I replied I don't know. She got a funny look on her face and said and what happened about the talking to strangers talk you used to give me... oooops! lol Thanks for sharing! Thank the Lord for moms who keep us on the straight and narrow! I had to post quick this morning and then leave for several hours...so thanks for being worth the WAIT! #6 - You are just weird. :-) I drive myself crazy trying to figure out the quickest line! Your answers were such fun. Aw Kel #10 I just had to laugh...I think that was me. Now I sell a house about every 5 years - and that's how I like it...my 'real' job is more consistant, just sayin. Patience not so much my strong suit either!